I've said it before, and I'll say it again. This blog is my love letter to the city of Dallas. I LOVE shining a spotlight on the people, places, events and businesses that make it a great place to live, work and raise a family. Because I write about the many faces of Dallas, I'm always curious what people are drawn to. I thought it would be fun to look back at the traffic and see what my most read posts of 2015 were to give me a direction for how to proceed as we enter 2016. Reality TV and celebrity coverage led the pack, which is not that surprising considering that stories about national topics tend to lead to clicks from around the world and not just my usual Dallas-based readers. So, what topics had readers talking this year? Personally, I am shocked that this post made the top ten. According to the Dallas Museum of Art, Pollock is "the greatest painter this country has ever produced". According to me, his work is complete crap. My philosophy on art is that anything I could create myself - is not art. But, clearly Pollock has his supporters because critics have hailed his work as “sensational," "exhilarating," "genius," “revelatory,” and “revolutionary”. Is it interest in Pollock's work that led to the large number of clicks on this post or the fact that it was published the same day as my post announcing Bravo's Real Housewives of Dallas? Hmmm. One can only wonder. In March, I was devastated when Amy Vanderoef announced she was leaving WFAA's Good Morning Texas after 10 years of co-hosting the morning talk show. The next day it was revealed that my good friend, Jane McGarry would be replacing her. McGarry had been the evening news anchor at NBC for 25 years and is a legend in this town. The move had tongues wagging and mouses clicking to get the scoop! In January, Fashion Group International of Dallas (FGI of Dallas) announced its annual Rising Stars honorees. The Rising Stars event shines a spotlight on Dallas’ up-and-coming fashion leaders, who are already breaking into national fashion headlines. As web traffic indicates, fashion matters in Dallas. #6: What Canceled Dallas Reality TV Show Would You Like To See Return? As my Dallas Dweller series points out, "Dallas is full of colorful characters. There are those you see monthly in the society pages, whose stories are legendary in this town. But, this feature is inspired by the people that I think you should know more about because of their fabulous style, interesting back-story or amazing accomplishments. There are many in the ladies-who-lunch crowd tend to say (Locken) is too pretty, too loud, has too much personality. She's just.. too much. This bigness makes her an easy target for jealousy and ridicule from some, and on the flip side, makes her adored by many. Read more about the woman who clicked her way to the #5 most talked about position on this blog. In this post I stated, "When I say these are the "best" charity events in Dallas, I am not talking about the most worthy charitable endeavors. Every non-profit organization has great intentions towards an admirable cause. But let's face it, there is only so much time and money one can give. At the end of the day people are looking for an event that not only provides them with a way to give back to a cause or their community but also provides a great experience, delicious food, great people-watching and an amazing experience that still has you talking about months later." See what event made my year and stay tuned to a revamp of this post for 2016 coming soon! BOOM! Right out of the gate, my first post of 2015 took off like a rocket. Because, let's face it, everyone wants to know what their favorite celebrities, sports stars, journalists and TV personalities are doing - especially on the biggest party night of the year! You'd better believe that on January 1, 2016 I will be publishing another post showing you how Dallas' most famous faces brought in the New Year. And my NUMBER ONE most popular post of 2015??? Is it really any surprise?! 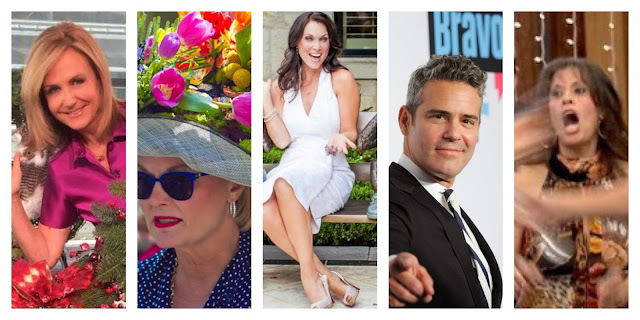 This post had more click-thrus than all other nine posts combined proving that the thirst for the Real Housewives of Dallas is real and cannot be quenched! Casting for a docu-drama began in August 2014 and the pitch was for a show tentatively titled "How To Make It In Dallas". In March, Bravo shocked everyone (including the cast) when it announced Ladies of Dallas to their lineup as a follow-up to their smash hit Ladies of London. So how and when did it change to Real Housewives? Click through to the post for more on this story and get ready for some tea, my loves, because 2016 is going to be juicy and delicious!! I so much appreciate everyone who reads my stories, retweets my posts, and shares my articles to your Facebook Friends. I hope they inspire you to get up off the couch and discover all of the people, places and events that make our city unique, special, and SO MUCH FUN!